Global automated breast ultrasound systems market expected to generate revenue of around USD 1503 million by end of 2024, growing at a CAGR of around 22.30% between 2018 and 2024. Automated breast ultrasound system (ABUS) captures ultrasound images of the breasts through a transducer, which helps in scanning the whole breast. The report covers forecast and analysis for the automated breast ultrasound systems market on a global and regional level. The study provides historical data for2015, 2016, and 2017along with a forecast from 2018 to 2024 based on the revenue (USD Million). 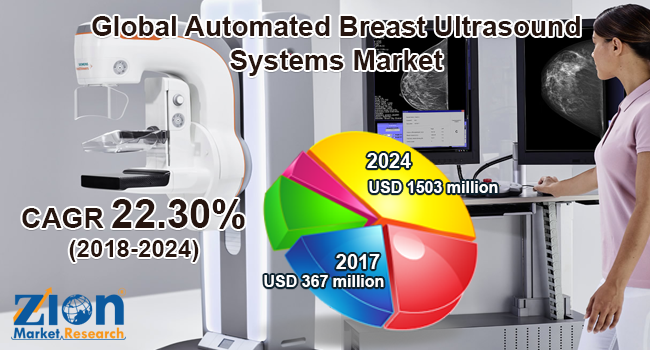 The study includes drivers and restraints for the automated breast ultrasound systems market along with the impact they have on the demand over the forecast period. Additionally, the report includes the study of opportunities available in the automated breast ultrasound systems market on a global level. In order to give the users of this report a comprehensive view on the automated breast ultrasound systems market, we have included a competitive landscape and an analysis of Porter’s Five Forces model in the market. The study encompasses a market attractiveness analysis, where the product, application,end-user, and regional segmentation are benchmarked based on their market size, growth rate, and general attractiveness. The report provides company market share analysis in order to give a broader overview of the key players in the market. In addition, the report also covers key strategic developments in the market, including acquisitions & mergers, new product launches, agreements, partnerships, collaborations & joint ventures, research & development, and regional expansion of major participants involved on the market on a global and regional basis. The study provides a decisive view of the automated breast ultrasound systems market by segmenting the market based on product, application, end-user, and regions. All the segments have been analyzed based on present and the future trends and the market are estimated from 2018 to 2024. Based on product, the automated breast ultrasound systems market is segmented into automated breast ultrasound system and automated breast volume scanner. Based on application, the automated breast ultrasound systems market is bifurcated into screening and pre-operative evaluation. Based on end-user, the automated breast ultrasound systems market is divided into hospitals, ambulatory surgical units, and diagnostic centers. Growing awareness of breast cancer resulting in the number of women undergoing breast screening along with the availability of funds to install relatively expensive automated breast ultrasound systems are the major driving factors of automated breast ultrasound systems market. However, the excess price of dental treatment and a dearth of trained and skilled specialists and professionals to operate the tool may hinder the growth of the automated breast ultrasound systems market. The regional segmentation includes the current and forecast demand for North America, Europe, Asia Pacific, Latin America, and the Middle East and Africa with its further divided into major countries, including the U.S., Germany, France, the UK, China, Japan, India, and Brazil. The report also includes detailed profiles of several key players, such as Koninklijke Philips N.V., Siemens AG, SonoCine. Inc., iVu Imaging Corporation, Hitachi Ltd., General Electric Company, Delphinus Medical Technologies, Inc., SonoCine Inc., and Hitachi, Ltd., among others.